Tyhee Lake Provincial Park is situated in the beautiful Bulkley River Valley. To the west are the Telkwa and Bulkley Ranges of the Hazelton Mountains and to the east is the Babine Range of the Skeena Mountains. Back from the 200 m sandy beachfront on Tyhee Lake is a forest consisting primarily of trembling aspen. These trees are second-growth, replacing the original cover that was destroyed by fire 40 to 50 years ago. Visitors may enjoy hiking, walking, swimming, picnicking, and nature viewing. Ice fishing and cross-country skiing are popular activities in the winter. Licenced motor vehicles, including motorcycles, are restricted to vehicle roads and parking areas. Please keep vehicles and equipment on the camp pads or driveways. Unlicenced vehicles, including all-terrain vehicles and snowmobiles, are not permitted in the park. For safety reasons, firearms are not permitted in the park. Tyhee Lake Park is closed to hunting. Group campsite reservations are accepted at this park. Tyhee Lake Provincial Park is near Telkwa, off Highway 16, 10 km east of Smithers. Approved Tyhee Lake Provincial Park Management Direction Statement [PDF]. Because of the large size of the figures, they are listed separately. Canoeing is a popular activity on Tyhee Lake (as well as kayaking for beginners). Bicycles keep to roadways. Bicycle helmets are mandatory in British Columbia. Fishers of all ages can try their hand for native cutthroat of stocked rainbow trout. Minnows like the peamouth chub, red shiner, and pygmy whitefish can challenge the younger fisher. Anyone fishing or angling in British Columbia must have an appropriate licence. There are ice fishing opportunities in the park. Trails connect the campground and the beach area. Those who enjoy walking can explore the park along the shoreline of Tyhee Lake and through the aspen forest as they follow the 2.5 km Aldermere Trail. For your own safety and the preservation of the park, obey posted signs and keep to designated trails. Shortcutting trails destroys plant life and soil structure. Pets/domestic animals must be on a leash at all times and are not allowed in beach areas or park buildings. You are responsible for their behavior and must dispose of their excrement. Backcountry areas are not suitable for dogs or other pets due to wildlife issues and the potential for problems with bears. There are no lifeguards on duty at provincial parks. Swim within the designated area to avoid conflicts with power boats and water skiers. The beautiful sandy beaches are popular with young and old alike. Adults can relax on the grassy slopes or enjoy a game of volleyball. There are waterskiing opportunities in this park. From the boat launch, one can see a marsh, which harbours an army of like, including mammals and birds, small reptiles, fish and insects. The dead trees, bulrushes and cattails provide nesting sites and protection for a variety of birds. Look for the Downy Woodpecker or the Red-winged Black Bird. Visitors can enjoy cross-country skiing and showshoeing in the park. There are also ice skating opportunities. There are ice fishing opportunities in the park. A concrete boat launch and loading dock complete with parking are conveniently situated to the nearby day-use area. For boaters and water skiers, a separate beach has been developed adjacent to the swimming area. While campfires are allowed and campfire rings are provided at each campsite, we encourage visitors to conserve wood and protect the environment by minimizing the use of fire and using campstoves instead. Limited burning hours or campfire bans may be implemented. Firewood can be purchased in the park, or you may bring your own wood. Fees for firewood are set locally and may vary. To preserve vegetation and ground cover, it is prohibited to gather firewood from the area around your campsite or elsewhere in the park (this is a ticketable offence under the Park Act). Dead wood is an important habitat element for many plants and animals and it adds organic matter to the soil. Cold water taps are located throughout the park. Hose hookups are not available for campers or trailers. 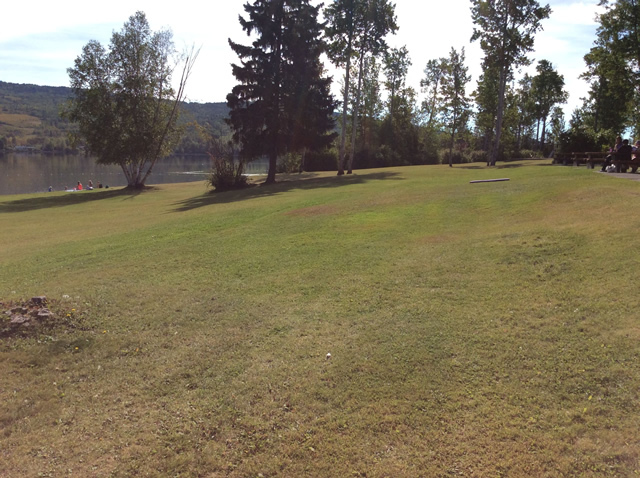 A large grassy day-use area features 26 picnic tables, most with fire pits, and an adventure playground. A picnic shelter, complete with a wood stove, is ideal for covered activities. Beside a lovely sandy beach there is a designated areas in the lake for swimmers. Visitors can also enjoy a game of volleyball. There are flush toilets, change rooms, and showers available. Note: the day-use area is open all year, but the snow is not plowed during the winter. Visitors will find pit toilets located throughout the park. There is a flush toilet located centrally in the campground. An adventure playground is located in the day-use area. A coin-operated sani-station is located along the entranceway into the park. Showers are located in both the campground and day-use area. The campground offers vehicle accessible sites, including two double sites and four tent sites. The campsites are private and secluded, perfect for a relaxing retreat. There is a large parking lot available for extra vehicles. A gate is located at the entrance of the park and is locked from 11:00 pm to 7:00am daily. To enhance visitor enjoyment, a volleyball net and horseshoe pits are provided. Campsite reservations are accepted and first-come, first-served sites are also available.